This programme combines the units from the BTEC Level 2 Diploma in Horse Care, with the addition of three specialist equine nursing modules comprising the TOCES Introductory Certificate: Equine Nursing Care Assistant. This BTEC Level 2 Diploma is classified as a BTEC First; a QCF Level 2 qualification designed to provide a specialist work related qualification giving learners the knowledge, understanding and skills needed to prepare for employment. This qualification also provides career development opportunities for those already in work and can be studied full-time or part-time in school or from home. BTEC Firsts provide much of the underpinning knowledge and understanding for the National Occupational Standards for the sector. This Level 2 Diploma is recognised as a Technical Certificate and is recognised by employers. It is broadly equivalent to four GCSEs. On successful completion of a BTEC First qualification, learners can progress to or within employment and/or continue their study in the same, or related vocational area. This programme is delivered through blended learning which consists of tutor-supported online studies via a bespoke virtual learning environment (VLE) combined with practical training. Learners are required to complete 100 hours of work experience (paid or unpaid) in a veterinary practice with equine provision. Upon enrolment students are provided with access onto our online E-Learning Centre where they will find all of their course material, assignments and other helpful study resources. In-text questions to answer and in-text activities to complete as students work through their course material. Separate answer sheets are provided at the end of each module. Over the course of the programme students will have assignments to complete for each module – referring to the course material, students complete the work assignments at their own pace and submit each in turn for marking and assessment. Student work is carefully checked by qualified tutors, graded where appropriate and returned to with detailed feedback. Students will also complete practical assessments at study weeks. For all other learners it is not necessary to be working with horses to undertake this programme. Mature learners (21 and over) may present a more varied profile of achievement that is likely to include experience of paid and/or unpaid employment. Documents and skills relating to work experience: Students will learn about and develop: job advertisements; their CV and covering letter; the application form; job/role descriptions; essential and desirable personal requirements. Student will learn about using these documents in an appropriate way. Reporting on the work experience; Students will need to provide a description of their employer’s business, a description of employees’ roles, pictorial evidence about the employer/site e.g. maps, plans, photos, leaflets, descriptions of how the business makes income; a description of their own role within the organisation and tasks they carried out. These will be provided in a variety of presentation methods e.g. verbal, written and visual. Work related experience could be as part of a placement while at school or voluntary work within the sector, for example in a veterinary practice, equine welfare centre or riding school. Feeding and watering horses: preparation for feeding (stable, at grass); selection and preparation of equipment; identification of feedstuffs; weighing and measuring of feedstuffs e.g. hay; allocation/distribution of feed from instructions (concentrations, roughage); timing and frequency of feeding; presentation of feed; feeding for life stage, work stage, health status; record keeping and reporting of feeding habits/food stocks; health and safety considerations; Personal Protective Equipment (PPE); feed room daily maintenance. Watering: selection and preparation of equipment; health and safety considerations; PPE; timing and frequency of watering; record keeping and reporting of watering habits where appropriate. Principles of feeding and watering horses: rules of feeding (stable, at grass); common feedstuffs; forage (concentrate ratios, basic rations); feeding regimes; timing and frequency of feeding; presentation of feed; types of feed e.g. hay, soaked hay, ryegrass hay, haylage, silage; quality; checking; safe storage; feeding methods (hay nets, floor, rack, mangers, floor, feed bowls) recognition of hard feed e.g. cubes, mix, oats, barley, chaff, sugar beet; quality; storage; correct preparation; health and safety considerations when feeding; horse welfare. Importance of provision of water; presentation of water; methods of watering; health and safety considerations when watering; horse welfare. Basic feed ration for a horse: amounts fed; weighing out; different feed types and amounts; provision of water; balanced diet; supplementation; reasons for rations (life stage, work stage, health status, fitness status); simple ration formula. Information will be provides on the different nutrients such as sources and function of water, carbohydrates, fats, protein, fibre, vitamins and minerals; importance of fibre to the diet. Work out a basic feed ration for a horse: assessment of horses (weight, condition, work); daily feed ration calculation for different horses; use of simple formula; feeding horses using basic rations; monitoring and recording of daily feeding habits. Preparing, cleaning and maintaining stables: personal protective equipment (PPE); equipment for cleaning and maintaining stables e.g. fork, barrow, bucket; checking equipment for suitability and safety; cleaning stables and yard to industry standards using correct equipment and procedures and abiding by health and safety and yard policy; disposing of waste safely and sustainably; checking stables for hazards and carrying out necessary maintenance tasks as required. The care and maintaining of storage and working areas: tack room; yard; staffroom; feed store; hay store; water troughs or taps; office; school (indoor or outdoor); car parks and facilities specific to the yard; equipment stores. Students will learn to ensure that areas are clean; tidy; free from equipment; provide correct storage to discourage vermin and pests; maintain separation of animal and staff areas; maintain health and safety; provide access for all. Students will learn how to carry out maintenance as necessary. Routine stable duties: mucking out; use of different materials; horse safety; muck heap maintenance; health and safety issues; disposal of waste; PPE. Daily routines, maintenance around the yard e.g. yard, feed and tack rooms, feed storage; yard responsibilities; safe and effective working practices; health and safety; environmental considerations. This module will also include other routine husbandry tasks and provide students the knowledge to assist in tasks such as shoeing, worming, vaccinating and record keeping. Daily checks on horses: horse daily health checks such as hydration; temperature, pulse and respiration; appetite; movement; faeces and urine; mucous membranes; coat; frequency e.g. am, pm, during the day, late night; importance of checks; record keeping; reporting to e.g. supervisor, manager. The handling and restraint of horses: horse behaviour in regard to handling techniques; health and safety issues of handling horses; physical and mental condition of the horse; capture methods. Equipment: bridle; head collar; lunge line; chifney; twitch; selection and use of personal protective equipment (PPE); correct use of handling and restraint equipment. The use of restraint: application of control methods and equipment; communication with assistants; health and safety. This module will also introduce learners to the handling of horses in a variety of situations such as preparing for exercise; turning out; maintenance e.g. grooming, treatment, health checks and clipping treatments. Other topics covered in this module include, the attitude of handler; influence of handler; correct approach; handling techniques; identification of horse’s body language; horse’s response to handling; physical condition and temperament of horse, reasons for restraining horses, need for restraint; methods of restraint including holding up a leg, pinching the skin on the neck, bridle, headcollar, lunge line, chifney and twitch; advantages and disadvantages of each method; animal welfare, signs of stress; when to seek assistance; animal welfare. Fitting and removal of horse clothing: to include indoor rugs e.g. stable rug, thermal rug, summer sheet, sweat rug, surcingles; outdoor rugs, rain sheet; bandages: tail bandage, stable bandages, travel bandages; boots: over reach boots, brushing boots. Fitting and removal of tack for exercise: to include the selection of equipment; taking measurements; testing for size; the tack: snaffle bridles, general purpose saddles, martingales, noseband, bits, breastplates and numnahs; different boots: over reach boots, brushing boots. Students will also learn about the purpose of exercise and different exercise techniques such as schooling, hacking, hunting, dressage, eventing, and show jumping. Information will be provided on the removal of equipment, cleaning and preparing before storage, method of storage (tack room, tack locker, trunk, and lorry) and presentation of equipment for storage. Clean and maintain tack: taking apart and reassembly of bridles and saddles, stirrups, and girths; procedures for cleaning tack and equipment; checking for safety and condition. Principles of fitting: how to take measurements; testing the equipment; suitability of use; choice of equipment; checking for comfort and safety. This will also include the signs and effects of ill-fitting tack and equipment. Maintaining the health and wellbeing of animals: health records, signs of ill health, the wellbeing of animals through enrichment, exercise, mental and physical stimulation, the emotional needs of animal and medical treatments available to prevent ill health. Maintaining the welfare of animals: exercise routines, care and husbandry requirements, current animal welfare legislation and the relationship between legislation and daily care of animals. Diseases and disorders and their prevention and treatment: common diseases and disorders, prevention of diseases and disorders and treatment of disease and disorders. Cleaning and grooming horses: grooming kit and its contents, grooming procedure, reasons for grooming, daily foot care, the bathing procedure and care after washing. Trimming and plaiting horses: preparation and procedure for the feathers, bridle gap, bottom of tail and the equipment required. Students will also learn how to prepare manes for plaiting by thinning, shortening length, changing the style and laying the mane. This will be followed by the plaiting preparation and procedure taking into account the type of horses and the reasons for plaiting. Clipping horses, the purpose of clipping, the types of clip, preparation for clipping and clipping safety. Assessing grazing land for the introduction of horses: checking perimeter fences, checking for flat even ground for horses to graze to avoid injury; carrying out rotation of horses on grazing land to ensure longevity of the grass; assessing the area for poisonous plants and weeds; assessing the quality and quantity of grass available; checking for adequate shelter against prevailing weather; checking water provision; assessing access for horse and handlers. Turning out and catching up horses from grazing land: checking of horses and area prior to turning out, monitoring and assessing horses’ behaviour and interaction during grazing checking for hazards, assessing the safety and suitability of equipment used to lead out or catch horses, wearing correct personal protective equipment (PPE) and abide by health and safety; ensuring correct timing of turn out. Maintaining horses at grass: types of boundaries and shelters. Different factors to consider such as proximity of water supply to horses, poisonous plants and weeds, safety of horses and handlers in the field, catching and handling techniques, frequency of skipping/picking the field and reasons for doing so, rotation of horses at grass to protect the land. The roles of horses in society: major stages of evolution, physical changes that have occurred throughout evolution, selection pressures, the origins and distribution of the four types of primitive horse before domestication, links between environment and physical characteristics, development of modern day breeds. Students will also learn about modern day breeds including hot and cold blooded horses, their physical characteristics; temperament and their current uses e.g. working, military, sporting, leisure. The natural lifestyle of the horse: herd living, herd make up of harem and bachelor groups, fight or flight response, lifestyle e.g. grazing, foraging, sleeping, grooming, loafing, rolling, playing and mating; herd hierarchy. Communication methods, body language and outline, dominance, submission, aggression, fear, play and social interaction. Learning this will benefit the horse human relationship to include handling, interpretation of horse body language and signals, identification of horse’s state and the safety of handler. The impact of domestication on the horse: differences in lifestyle, access to food and water, choice of diet, changes in feeding behaviour, social interaction, exercise, health, time budgets. Students will look at traditional management and the horses adaptations to this domestic life along with abnormal stereotypical behaviours such as weaving; crib-biting; wind sucking; box walking and discuss the causes, signs, prevention and management of these by focusing on natural lifestyle and instincts. Monitoring and reporting on horse behaviour: Observation of behaviour in different environments, the effects of routine and management, before and after periods of exercise or turn out, during feeding, with or without companions present. Students will learn how to record observations, identifying and recording of normal and abnormal behaviours along with reporting and commenting on the significance of these observations and reporting findings and making suggestions for action to be taken. Lungeing a horse under supervision: correct selection of equipment, correct application and fitting of equipment; checking tack for safety; purpose and reasons for use of equipment. How to lunge following instructions and supervision to include appropriate circle size, maintenance of control throughout including halt, walk, trot, transitions and changing the rein, rhythm and balance, safe and effective use of the whip and lunge line, use of voice, language, body position and stance, health and safety and dealing with common problems. The reasons for exercising horses from the ground: reasons for lungeing and the planning and undertaking of lungeing taking into consideration the environment, the horse, experience of handler, personal protective equipment (PPE), the length of session. Students will also learn how to long rein, the reasons for long reining. This unit aims to introduce learners to the principal equine anatomy and physiology which is relevant to veterinary nursing practice. It also introduces the concepts of professionalism, communication skills, and the roles and scope of practice of members of the veterinary team. Finally, it will prepare learners for emergency situations by outlining the principles of equine first aid, triage and emergency admission into the clinic. This unit aims to introduce learners to the importance of stringent hygiene procedures within the equine hospital. It also expands upon the earlier BTEC Unit 6 – Maintain Animal Health and Welfare, to cover the assessment of patient condition, maintaining clinical records, the application of care planning, and the administration of medication. Finally, it introduces learners to a variety of diagnostic processes which may be carried out by veterinary surgeons, veterinary nurses and nursing technicians/assistants. 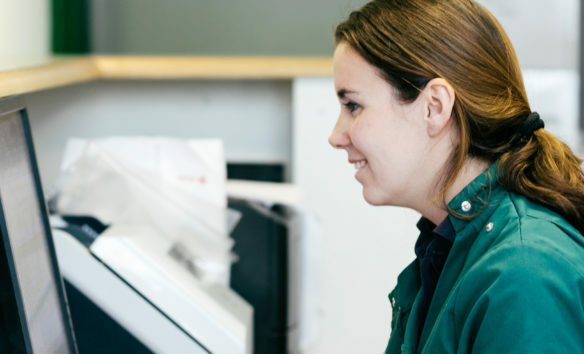 Principles of nursing in the equine veterinary hospital: clinical record keeping; clinical records; daily record sheet; abbreviations used in clinical record keeping; management of the in-patient; changes to in-patient parameters; nursing plans; behavioural assessments of in-patients; post-operative patient care. This unit aims to introduce learners to theatre design, aseptic cleaning techniques and common surgical instruments. It will also explain how to prepare a patient for surgery, along with outlining the roles of theatre staff during the surgery itself. It will also introduce the types of drugs found in veterinary practice, the principles and legalities of stock management, and finally the legal requirements for prescribing and dispensing medicines. The surgical theatre environment: theatre layout, essential equipment, cleaning the theatre. Instruments: cleaning, maintaining and identifying surgical instruments, autoclaves, packing materials, identification. Preparation of surgical patients: the theatre list, patient preparation, preparing the surgical site, additional preparation of the patient prior to surgery, shoe removal, identification. Positioning; use of the hoist, positioning the operating table, positioning the horse on the operating table, drapes, wedges, positioning aids, padding. Preparing for surgery: role of the theatre nurse, scrubbing in, gloving and gowning, closed gloving, open gloving, laying out surgical tables. Legal categorisation of veterinary medicines: AVM-GSL: Authorised veterinary medicine – general sales list, NFA-VPS: Non-food animal medicine – veterinarian, pharmacist, POM-VPS: Prescription only medicine – veterinarian, pharmacist, POM-V: Prescription only medicine – veterinarian, Controlled drugs (CD): Schedules 1, 2, 3, 4 and 5. Pharmacy stock management: stock management, safe storage of medicines, legal requirements for record keeping of pharmacy stock, ordering, recording, delivery, usage and storage. Veterinary prescription: veterinary prescribing cascade scheme, controls on marketing of animal medicines, drug data sheets, formulae and common abbreviations used in prescribing and dose calculation. Advice to clients: written instructions, demonstration, ask client to demonstrate back, follow up.